Notestoponder asked a simple question: “can someone explain the 4th dimension”. The responses she got were disappointing. Standard high school explanations such as “time is the fourth dimension”, or “imagine color or transparency” as a fourth dimension. Now, I could launch into a diatribe about the limited understanding that those “in the know” seem to have about this subject but why bother? The fact is: there is a lot of miss-conception about the fourth dimension. I have made it one of my missions in life to clear these up. Although I humbly accept that whatever I have to say, shall most likely remain in a remote eddy of the blogosphere we may still rejoice; you found this! If this is the first time you are here, there has been a bit of a thread about higher dimensions going here. Here is are a few shortcuts to other posts. “Oh, grow up out of your pre-school dimensions“, reminds us that we can’t really see in 3D. I mean, have you ever seen the night sky in 3D or do the stars all seem to be just as far away? To make matters worse, it turns out that there aren’t really 1, 2, or 3 dimensions but 2.1432, 1.32, 3.213 etc. “Far fetched facts or fancy fiction“, has a go at explaining dimensions including the fourth dimension. A helpful post, but only a start. “Fourth dimension for skeptics“, a makers guide for a real four dimensional object. Strangely enough this actually works! “Hyper fractals for fourth dimension geeks“, introduces four dimensional fractals. So the fourth dimension really exists then? “Making sense of a four dimensional tree“, takes these four dimensional fractals a little further by showing a rotating four dimensional tree animation. I was so pleased with the progress with the hyper fractals that I decided to add some more dimensions. If you’re maths hungry, don’t miss out on this most beautiful equation. Do not look there if maths brings back childhood traumas. So, I made this 6 dimensional tree fractal. Here is an animation of this fractal rotating in various directions and seen through the viewport of our (approximately) three dimensional eyes. But… it is all rather disappointing. Whether we look at a 4, 5, 6 or a whatever-dimensional tree, in our little 3D world, they all look somewhat similar. We can rotate them any way we like, they don’t make much sense even if they are somewhat pleasing. Back to square one. It turns out that there are two questions that get mixed up all the time. What is the fourth dimension and what is seeing in the fourth dimension like. The first question is intellectual whereas the second is experiential. I can answer both separately but there is a snag with experiencing the fourth dimension that I haven’t solved yet (but will). The snag is that for now I can only give you a four dimensional seeing experience of a three dimensional object. This is cool enough but it opens up a can of worms. We all know that we can look at a two dimensional object, a post card perhaps with one or two eyes, i.e. in 2D or in 3D. The post card will look the same except that when we look with two eyes we can see depth in the scene around the post card, i.e. the room we are in. Similarly, I can show you a 4D view of a 3D object. It will still be a 3D object but we can see the 4D context around it. There is another surprising thing about this. You have already experienced a 4D viewpoint, so often in fact that it just feels normal. And since you have been told by your physics teacher that we can only see 3D, it never occurred to you to challenge this. Too bad, because you really can see in 4D, but mostly you’ll be looking at 3D objects rather than the more illusive 4D objects. For starters, the 4th spatial dimension, after the 1st (length), the 2nd (surface) and the 3rd (volume and depth) is a dimension that allows us to see a three dimensional object from all sides or angles at once. In that sense it is an omniscient dimension, in the true meaning of that word. Nothing supernatural here. Try and imagine seeing something from all sides at once. One example would be the scene in The Matrix where Keanu Reeves jumps in the air to kick the bad guy. The shot freezes in mid air and the camera spins around him giving a omniscient viewpoint. This scene is not only stunning from a cinematographical perspective; it actually gives a you a glance at a 4D perspective. I tried to create an animation that gives a 4D viewpoint of a 3D object. For this you need colored 3D glasses. I’m not happy with the result for reasons that will become clear a little further down this post. But the fourth dimension goes a little further than giving a omniscient view of 3D world. A real 4D object will project a different 3D ‘thing’ in our three dimensional viewpoint depending on the angle it is viewed from. You can see this in the animation of the four dimensional tree below. As it turns it seems to change but that is just an effect of looking at it from different 4D angles. Another thing we can see with four dimensional objects is that when they pass through our 3D viewport (our world), they may appear to shrink or grow even though the actual 4D object doesn’t change. In short, 4D objects appear to behave strangely when seen through a 3D perspective. There is a lot more to say about 4D objects but none of this helps our comprehension of what they really are. I went for a walk to consider all this and walked literally into a four dimensional ‘thing’: my shadow. Walk with me for a moment and you might just get an intellectual glimpse of the fourth dimension. When you walk past a lamp post at night then as you walk away from it, your shadow will grow longer and longer. When you walk towards it, the shadow behind you will get shorter. The shadow itself is like a cutout of your profile and depending on whether you walk away or just past the light, your profile may be frontal or a side view, or somewhere in between. Imagine that you stay put and that there is more than one lamp post around you. 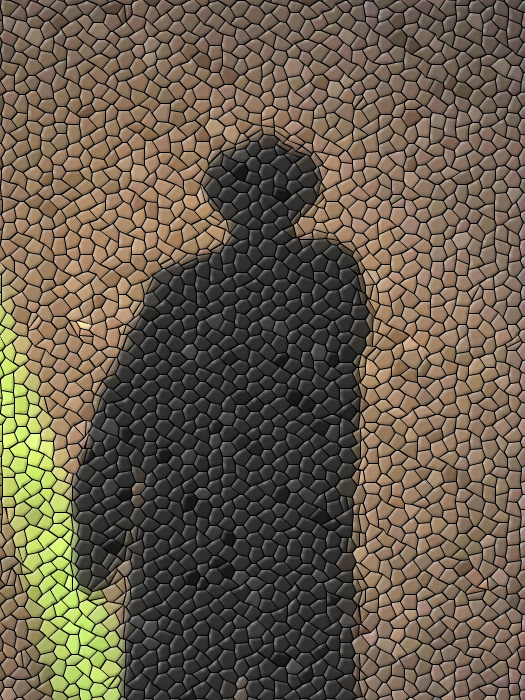 Each one will throw your profile as a different shadow at a different place on the street. Now imagine that there infinitely many light points all around you at any distance or direction possible. Light points everywhere. Now, each one will throw your profile as a shadow at different places on the street. Infinitely many shadows in infinitely many places. Although they all overlap and you can’t really see one from the other, they are there all right. Each one is there, each one distinct. Infinitely many all at the same time. If you want to think a little deeper, you will realize that each shadow is like a dark cone that projects from your body, with one of the light sources at its apex. All those shadows are really just reflections of your body cast from an omniscient light source. All together these shadows are a four dimensional thing. As you stand there in that omniscient light, you are casting a four dimensional shadow that is all around you. That four dimensional shadow isn’t visible. At best we can view a few shadows at a time. But we can get an idea of what it would be like to see in four dimensions. I don’t know where you are as you read this but if you can just look up from your screen into one direction without moving your head. You can see a scene in front of you. Without moving your head, you can see depth. You have a sense of distance. Now if you keep looking at the same scene but get up and walk a little to the side whilst keeping your gaze in the same direction, you will notice that the scene takes on a lot more depth. Don’t just turn your head, you need to move around. By moving around the room, you will have a much stronger sense of the distance between objects and how to they are spatially related. If you stop and look again without moving, you can still see depth but it won’t be as rich, you loose that sense of spatial relationship, of space itself. Here is why: when you move around and look at things from different angles, you will get a partial omniscient viewpoint, i.e. a close-to-fourth dimensional viewpoint. When you stop, you will only have a one-sided three dimensional viewpoint. If you are willing to experiment a little you will find that keeping your eyes glued on some object as you walk past it or around it will give the strongest omniscient view. You will get glimpses of that 4D perspective and it can be quite impressive. It is nice to know that we have the ability to see in four dimensions, but it isn’t good enough. Myself, and you perhaps, won’t be satisfied until we can see a four dimensional object with four dimensional viewing ability. Bear with me, I’m working on this and promise to show such an object. Soon. A great example, and dare I say my mind shifted a little closer to understanding this topic. Excellent. Once you’re over, I’ll meet you on the 4th side. Better have some cheesecake ready, I suspect I’ll be needing it. We can definitely develop the ability to see higher dimensions. As you say, it starts with accepting that we have no limitations in this ‘regard’ (french for ‘seeing’). Have you ever notice the white arrow in the FedEx between the E and the x? Once you see it, you can never un-see it. The 4th dimension is a bit like that. It is hard to perceieve when you don’t know what you are looking at. Once you do, it becomes a lot easier and you notice it when a 4th dimensional angle or object presents itself.